se promener tranquillement le chemin de la plage d'enroulement pour les sables océaniques vierges! Situé à l'extrémité sud souhaitable de Wrightsville Beach, tout près de Crystal Pier et Oceanic Restaurant, cette unité sud 4 chambres 3 salles de bain offre une vue imprenable sur l'océan depuis le salon / salle à manger spacieuse. Asseyez-vous et détendez-vous sur votre face à l'océan pont tout en profitant de la brise douce! Prendre le soleil sur le toit-terrasse commune où vous pouvez voir miles de l'océan et la plage! Le salon / salle à manger, cuisine séparée, 3 chambres et 2 salles de bains sont à l'étage principal. L'entrée, 1 chambre, salle de bain, et salle de jeux sont sur le niveau du sol. Pour les grands rassemblements, réservez l'unité nord pour un total de 7 chambres - contactez-nous directement pour plus de détails! Douche extérieure. Parking pour 5 voitures dans l'abri et l'allée. Occupation: 16. Interdiction de fumer. Pas d'animaux de compagnie. After hurricane Florence (the longest hurricane EVER) dashed our original plans to stay at Fox/Keeney (south) in September, the owner and Bryant Real Estate were AMAZING to work with to help us reschedule our weekend at this property. I sincerely thank them for their flexibility and patience!!! The house itself is more about its location than its amenities. The house is adequate. The beds slept great but the house is a bit dated. But it's more about the beach than the house, right? And the beach is GREAT!! Elaina thank you for your review, we are glad that we could make it work out for you. We will share this information with the owner that you provided and we will see you next time. The property was very spacious and had an amazing beachfront view. All of my guests that joined me were at ease and had a great time. If this property is available again next year during the next beer fest, I will strongly consider renting it again! I would also note that the shower in the common bathroom did not work properly. However, that did not create any issues since we were able to share the other two bathrooms without too much interference. Bryant real estate could care less about the people renting from them. They are a classless organization. Read the other reviews, you will NOT be happy renting from them. Property was in disrepair yet they still say nothing is wrong. The location of the house was great. The space and supplies and the house was very accommodating. The roof top deck would be the best feature of the house but unfortunately after we had been there for a day or so the maintenance people came and told us that it was not safe to be up there. There had been a ribbon blocking off the steps to go up which had been removed before we arrived and we were not aware we should not be up there. The maintenance man came and told us it was not safe and we should not go up there. We should have been told before we came that the deck would not be available as it was a key feature of the house. .
Hi Mavourneen- Glad to hear the location was great! We aplogize for the inconvenice with the rooftop deck but all has now been repaired and is ready for much relaxation while enjoying those great ocean views! Hope to see you back at the beach agian soon! This is a fantastic beach house. We had 9 people in our family and were all comfortable. Great porch although I would like different furniture not real comfortable. Nice size living room and bedrooms. Kitchen well supplied. When we had an issue with our dryer and called it in someone came within the hour. Wonder service from Bryant Real Estate. Property description is accurate. 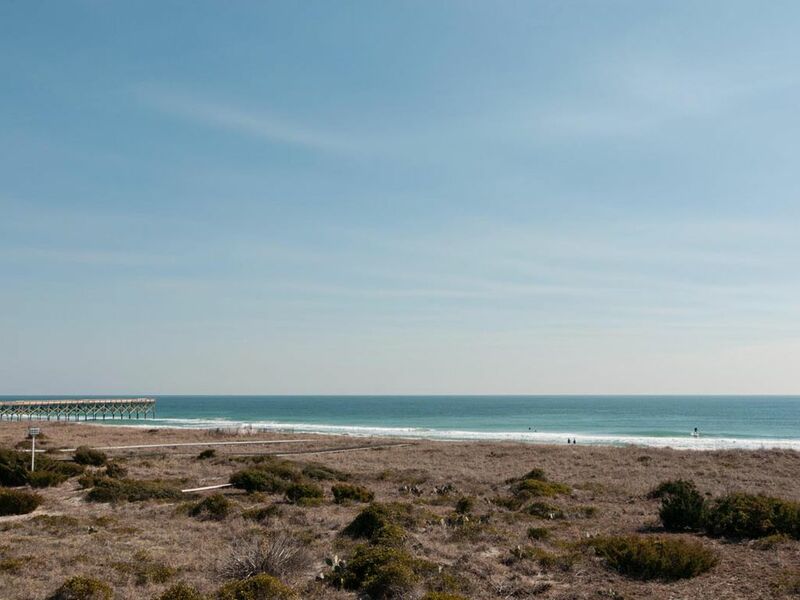 Great location, the south end to me is the only place to be at Wrightsville. Property clean and well maintained. Would recommend this property to others and will come back next year. Cape Fear Seafood is very good place to eat. I would stay away from Crystal Pier to eat NOT at all good. It has been going down hill every year. Bone fish Grill and Hieronymus Seafood is also highly recommended.